Guess what we're having Christmas morning? 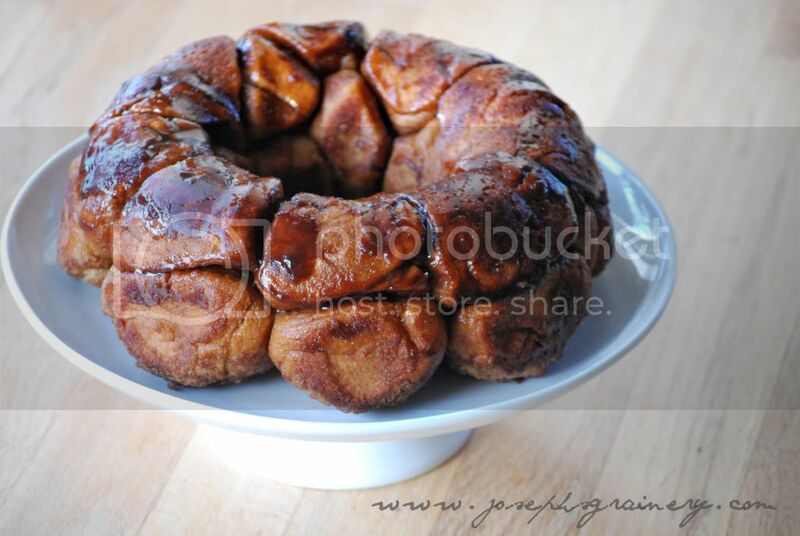 You guess it...this ooooey, gooooey goodness otherwise known as Monkey Bubble Bread. I just like the name, but MaMa and DaDa go gaga when they take a bite of it. They say it tastes almost as good as a Cinnabon. 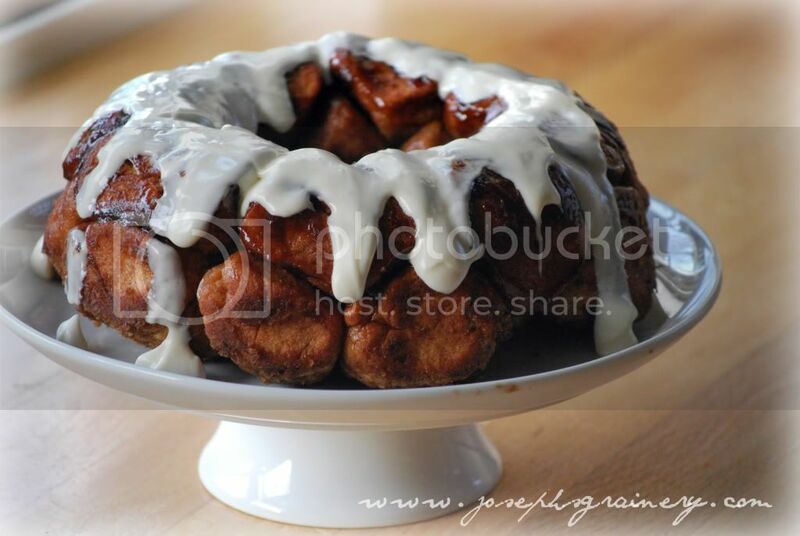 Monkey Bubble Bread purists would probably argue that this is how you should experience this cinnamon and sugar sensation (sans frosting), but at our house, we go all out and add the cream cheese frosting to it, which we'll give you the recipe for as well. 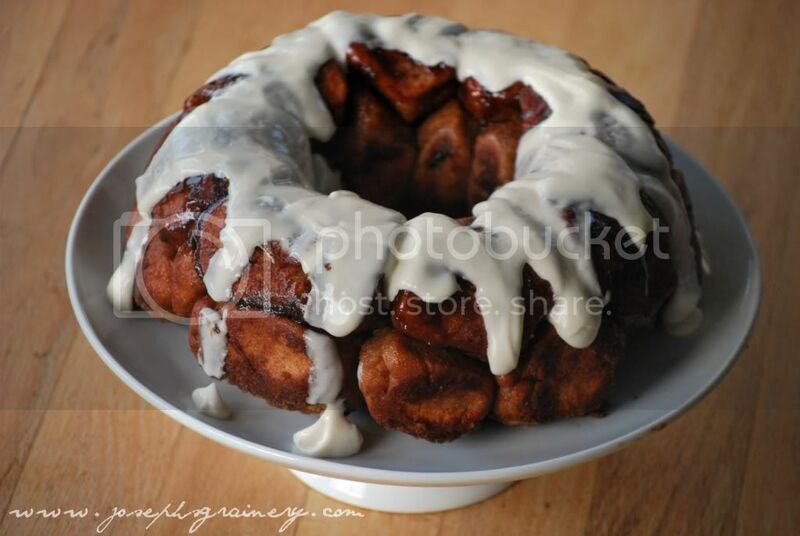 Generously spray the inside of a 10-inch Bundt pan with non stick cooking spray. In a small saucepan, warm your milk to slightly above room temperature, then remove it from the heat, add the yeast, and whisk to dissolve. (Do not warm it beyond 110 degrees F or you will kill the yeast). In the bowl of a standing mixer fitted with the paddle attachment, beat the flour, sugar, and salt until combined. In a small bowl, beat the egg with a fork and add it to the dry ingredients. Mix on low speed until combined. Keeping the mixer on low, slowly stream in the milk until combined. Add the melted butter and mix until the dough comes together. Replace the paddle attachment with the dough hook attachment. Continue to mix on medium speed until the dough becomes silky and tacky,but not sticky, 8-10 minutes. The dough should mound together and easily come off the bottom of the mixing bowl. Spray the bottom and sides of a large bowl with cooking spray. 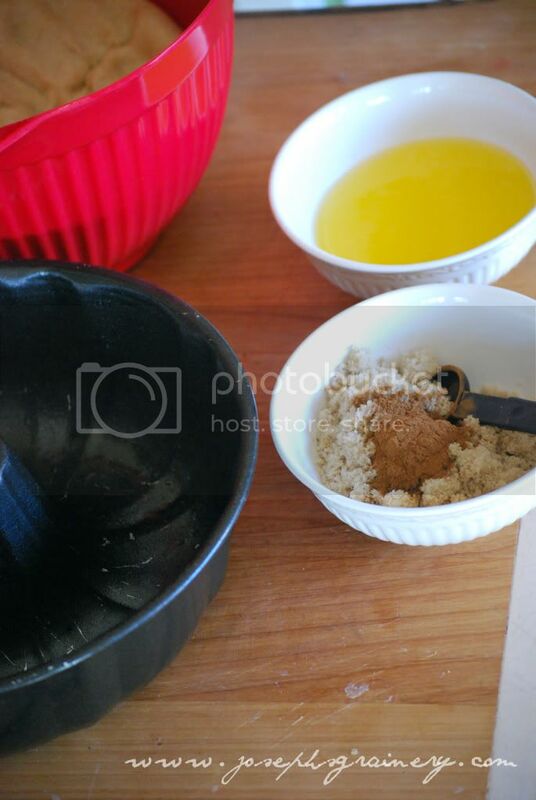 Place the dough in the bowl and roll it around to make sure it is completely covered in oil. Cover the bowl with plastic wrap or a dish towel and let it rest in a warm area until the dough has doubled in size, approximately 1 hour. Use your clean hands to push down and deflate the dough. Use your hands to pinch apart the dough into 1 1/2 inch pieces. Roll the pieces into balls (they don't have to be perfectly round). 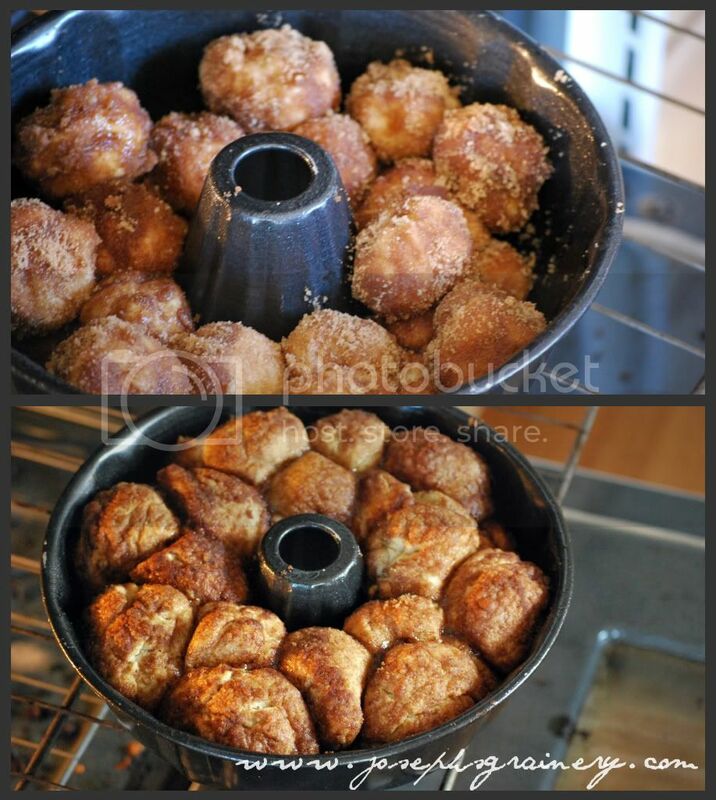 Make the Cinnamon Sugar Coating: In a small bowl, stir together the sugar and cinnamon. Place the melted butter in a separate bowl. Assemble the Bread: Dip one ball in the melted butter. Let the excess butter drip back into the bowl, roll the ball in the brown sugar mixture, and place it in the Bundt pan. Continue this process with each ball, until you have several layers, arranging them as if you are building a brick wall. Wrap the Bundt pan tightly in plastic wrap. Set it in a warm area of the house for about 1 hour, or until the dough balls have doubled in size and appear puffy. Preheat the oven to 350 degrees F. Remove the plastic and bake the Bundt until the top layer is deep brown and the caramel coating begins to bubble around the edges, about 30 minutes. Cool the bread for 5 minutes, then turn it out directly onto a platter and serve warm. Should you have any leftovers, simply reheat them in a 300 degree oven until warm to the touch. Thoroughly mix together 4 oz of cream cheese (softened), 4 Tbsp (1/2 stick) butter (softened), 1 1/2 c powdered sugar, 1 Tbsp milk, and 1 tsp vanilla until the frosting is smooth and creamy. 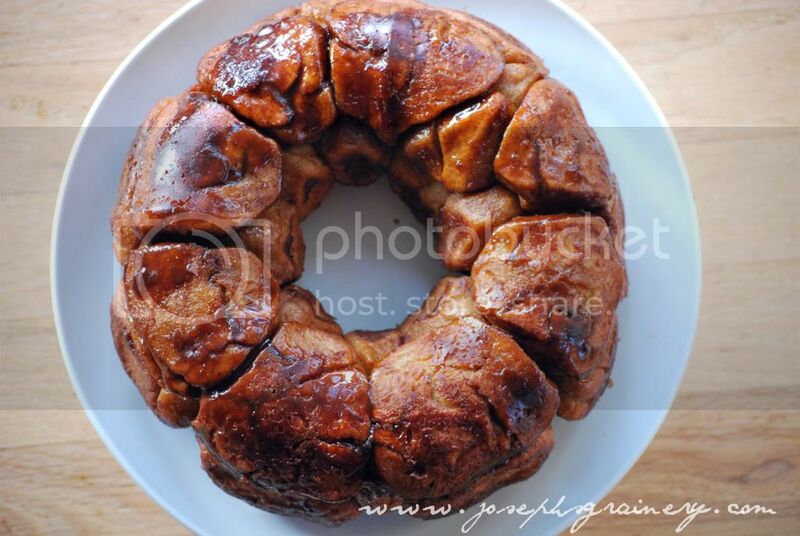 We found this recipe and will be sharing our whole grain version on Baked Sunday Mornings.